If you haven't heard yet, Ikseondong is one of the hottest neighborhoods of Seoul at the moment. The unique culture and vibe that Samcheongdong once embodied, died many years ago replaced by a cookie-cut projection of touristy Myeongdong while Bukchon is still nice though not so much on the days it's swarming with people. And in all of this is where Ikseondong has emerged. Ikseondong actually has many more number of hanoks than Bukchon itself though it has remained hidden away in a cluster just between the bustling streets of Jongno 3-ga and Changdeokgung. Wandering the mazes of this neighborhood really brings you back to the past and the charm exudes from every crack and peephole of the beautiful homes here. With its low property prices and history, young entrepreneurs have taken to converting some of these lovely homes into shops, cafes, and restaurants- not unlike what a young generation did a decade or so before in Samcheongdong and surrounding. The restaurants and cafes here have quickly become some of the most SNS-buzzing north of the Han River in cuisine ranging from French to gourmet coffees and teas. Ikseondong 121 is a bit unusual in that it remains firmly a home meal kind of spot. The renovated hanok inside has large windows which not only gives it a more spacious feel (despite there not being much actual wiggle room inside) and watching people stroll by in these narrow rich historic alleys is really something. The menu, as I mentioned, is comprised of down-home favorites but what's more is that the prices are extremely affordable. Mushroom and roots vegetables rice is 7.5K, chives and mushroom dwenjang bibimbap is 6.5K, manila clams and chives dwenjang bibimbap is also 6.5K, beef curry is 7.5 K, tomato chicken curry, lentil curry, curry noodles are all each 6.5K. Other interesting menus include a big chickpea green salad for 10K and taco rice for 6.5K. beer for 3 or 4K more (depending if you want Cass or Alley kat), a glass of red wine for 4K more, or if you want to add soo yook than add 3K more. For the curry dishes you can add extra curry for 2K or get sliced baguettes on the side for 2K as well. They also sell batches of the curry for takeout. Beer, makgeolli, soju, and various wines are also available. I opted for the dwenjang bibimbap with manila clams and chives with an order of sooyook on the side. The dishes come out on a nice wooden tray and really looks and smells like a home-cooked meal. With a big bowl of rice are chives and some fresh greens. Accompanying it is the big pot of dwenjang jjigae (soybean paste stew). It has far less "soup" than a regular jjigae and is instead brimming with cubed tofu, mushrooms, vegetables, and clams. It has a nice, light earthy flavor to it and you can tell this isn't a generic store bought dwenjang but it's also surprisingly light for dwenjang. Not too salty or strong in soybean flavor, it's wonderful mixed in with the rice as all the flavors and textures of the various ingredients remain fully alive. In between bites, had a bit of the sooyook. The sooyook was nice enough but rather "light" in flavor and portion. Even the kimchi served with was quite light and not quite balancing up to the boiled pork slices. I don't think i'd opt for the sooyook again. Friends ordered the beef curry. They definitely don't skip out on the curry portion and you can see they put in a lot of ingredients unlike a lot of chain curry houses that are more curry liquid than anything. Nice touches include the small side salads, pickled shallots (rakkyou zuke) and the half a hard boiled egg. Had a taste and it was great. Not too hearty but not too light and enjoyable for all ages. Note the portion of sliced baguette that comes with the extra order of bread... must be at least half a loaf! Another friend opted for the mushroom and chwi nameul (a kind of spring vegetable which Google is telling me is called aster) rice. This is a light, fragrant rice that is unseasoned and which makes it go perfectly with the savory kimchi, fermented squid, kim, pickles, etc. A bowl of simple dwenjang-based soup is also provided while the sooyook is, as mentioned, an extra side. There's some great cafe options nearby too which I'll try and get to in a future post. A fine place if you're looking for comfort Korean (and a bit of non-Korean) dishes that are light yet flavorful and healthy. The general Jongno area is quite an older neighborhood so if you're looking to take that picky significant other or treat a guest from out of town around here to some good food but with also great atmosphere, this is your place. Their extensive drinks options is also quite a bonus while finding such Korean restaurants that also serves wine is quite rare. 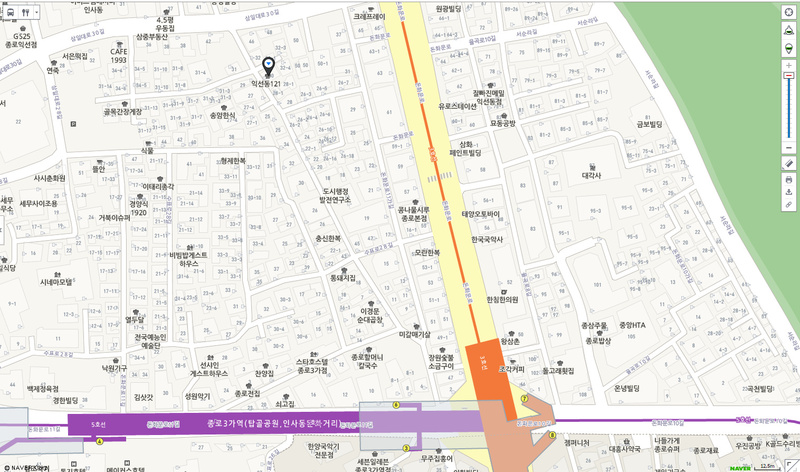 Come out of exit 6 of Jongno 3-ga Station and turn around towards the big 4way intersection. Just before the intersection you should see an alley on your left (Donhwamunro 11 Ga-gil). Walk about 20 meters and the road should split into two. Take the left street (Donhwamunro 11-Na-gil) and walk about 150m and you'll see Ikseondong 121 on your right. A big range of drinks available including beer, soju, various makgeolli and even wine! Their half-half curry are extremely popular not only for the visual but being able to taste 2 different kinds of curry. On weekdays they open until 10PM but oddly on weekends they only open until 8PM. They're quite popular on weekends so try and avoid peak lunch and dinner hours.